April 23 marked the 400th anniversary of William Shakespeare’s death at age 52. His plays have been performed down through the centuries in nearly every major language on every continent. To mark this year’s anniversary, festivals will take place all around the world, performed by major theatre companies and small community theatres alike. All will celebrate the legacy of arguably the greatest playwright in the English language. The world has changed significantly since Shakespeare’s time, but basic human nature really hasn’t changed. 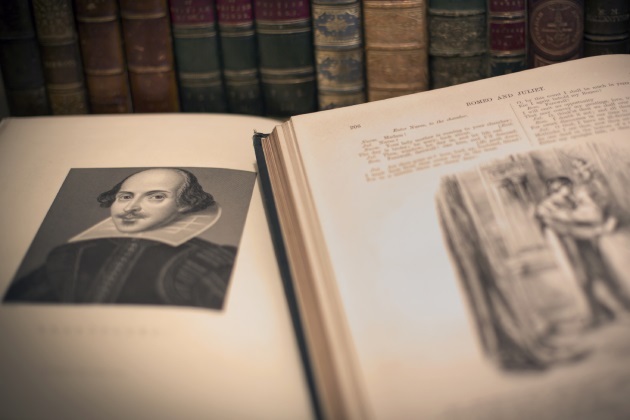 Joy, sorrow, love, lust, greed, hate and ambition – the basic human emotions are at the heart of every Shakespeare play and are what keeps the Bard’s works relevant even today. Theatre companies devoted to Shakespeare are found all across the country. For most, a busy summer season is about to get underway. Here’s a sampling of what some of the leading festivals have in store for theatregoers in 2016. Oregon Shakespeare Festival in Ashland, currently in its 81st year, is the Tony Award-winning granddaddy of U.S. Shakespeare festivals. Ashland draws some 400,000 playgoers each season to its 11 plays (four or more of them always Shakespeare). Plays are staged in three venues – the outdoor Allen Elizabethan Theatre, Thomas Theatre and Angus Bowmer Theatre. This summer’s productions include "Twelfth Night," currently running through October; ”Hamlet,” June 7 – October 14; "The Winter’s Tale," June 9 – October 16; "Richard II," July 5 – October 30; and "Timon of Athens," July 28 – October 29. In addition to the plays, a free outdoor "Green Show" featuring music and dance performances precedes the evening productions. Utah Shakespeare Festival in Cedar City is widely recognized as one of the best professional theatre events in the nation. Honored with a Tony Award for “Outstanding Regional Theatre” in 2000, the three-stage complex nestles on the leafy campus of Southern Utah University and presents nine plays each year from June through October. Attending a play at the outdoor Engelstad Shakespeare Theatre, a replica of England’s Globe Theatre, offers the ultimate Elizabethan experience. On tap at Englestad for summer 2016: "Much Ado About Nothing," June 27 – September 8, and "Henry V," June 28 – September 10. Also scheduled is "Julius Caesar," July 9 – October 22 at the indoor Anes Studio Theatre. Colorado Shakespeare Festival is a professional theatre company in association with the University of Colorado-Boulder. Since 1958, the festival has explored and celebrated Shakespeare and his continuing vitality and influence through productions staged each summer in the historic Mary Rippon Outdoor Theater and in the newly renovated indoor University Theatre. This season’s outdoor schedule includes "The Comedy of Errors," June 3 – August 7; "Troilus and Cressida," June 24 – August 6, and a one-night-only performance of "Henry VI, Part 2" on July 31. "Cymbeline" will be staged indoors at the University Theatre July 14 – August 7. Illinois Shakespeare Festival is produced in Bloomington by Illinois State University’s Theatre Department. Now in its 38th season, the festival has gained international recognition, staging 36 performances each season in the state-of-the-art 438-seat open-air Elizabethan-style Ewing Theatre. A pair of popular Shakespeare productions is set for this summer: "Twelfth Night," July 5 – August 12 and "Hamlet," July 7 – August 13. Shakespeare Dallas began producing its annual Shakespeare in the Park festival in 1971, making it one of the longest running festivals of its kind in the country. Playgoers enjoy lawn seating for performances at the Samuell Grand Park Amphitheatre and occasionally at Addison Circle Park. Summer/fall 2016 Shakespeare productions include "Richard III," June 22 – July 23 and "The Tempest," September 21 – October 16. California Shakespeare Festival got underway in 1973 presenting the bard’s plays at Hinkel Park in Berkeley. In 1991 the event moved to the 545-seat solar-powered Bruns Memorial Amphitheatre located in the scenic hill country between Berkeley and Orinda. For 2016, the festival offers two Shakespeare productions, "Much Ado About Nothing," May 25 – June 19 and "Othello," September 14 – October 9. Shakespeare Theatre Company, Washington, D.C. has hosted more than 150 productions during its 27-year history, entertaining some 2.5-million audience members on its stages at Sidney Harman Hall and Lansburgh Theatre. The company was honored with a Regional Theatre Tony Award in 2012. Shakespeare plays slated for this season include "Macbeth," April 25 - May 28; "The Tempest," August 16 – 28; and "Romeo and Juliet," September 13 – October 30. Hudson Valley Shakespeare Festival is about to kick off its 30th anniversary season with a 12-week run staged primarily in a spectacular open-air theatre tent on the grounds of Boscobel House and Gardens in Garrison, New York. The company also presents touring shows throughout the Hudson Valley. This year’s Shakespeare productions include "As you Like It," June 7 – August 27 and "Macbeth," June 8 – August 26. Fairbanks Shakespeare Festival is without question the nation’s northernmost festival of its kind. Starting with a performance of “Twelfth Night” alongside the Chena River in downtown Fairbanks, Alaska, in 1992, the Fairbanks Shakespeare Theatre has grown into a year-round production company and international touring theatre company. Beyond its outdoor performances each summer on the campus of the University of Alaska-Fairbanks, the company undertakes an ambitious education and outreach program, the cornerstone of which is the annual Bard-a-Thon each February – a 24-hour-a-day, weeklong reading of the entire works of Shakespeare. This summer’s production of "Titus Andronicus" is set for July 7 – 24, with a special performance July 29 at Tonglen Lake Lodge in Denali National Park. Florida-based freelance writer/photographer Dave G. Houser specializes in RV travel and contributes regularly to MotorHome, Trailer Life, Highways, Coast to Coast and TrailBlazer magazines.